My husband has several guitars and the usual hard-shell transport cases but his oldest acoustic needed a home. 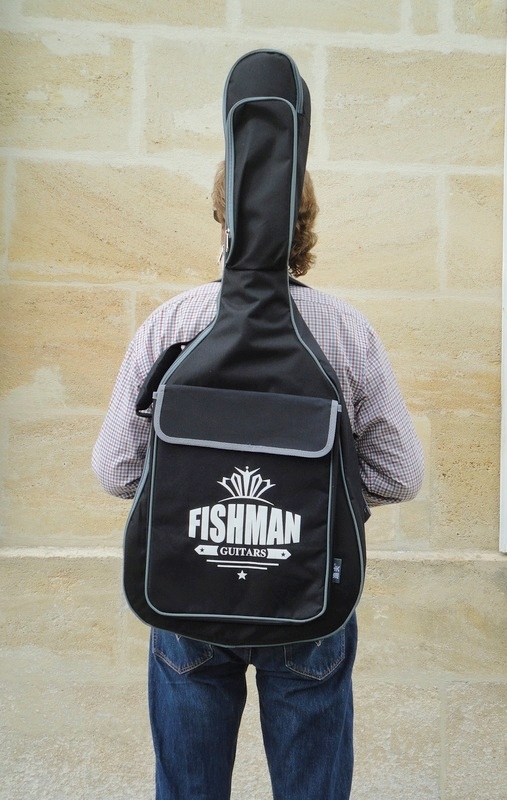 I was thrilled to see his reaction when I unwrapped the Fishman gig bag and it emerged in all its well-padded glory. The acoustic is deep-bodied and wide and, once we had the bottom slipped into place, the gig bag zip closed over its sinuous contours and it looked like it had been made to measure. The fit is extraordinary! 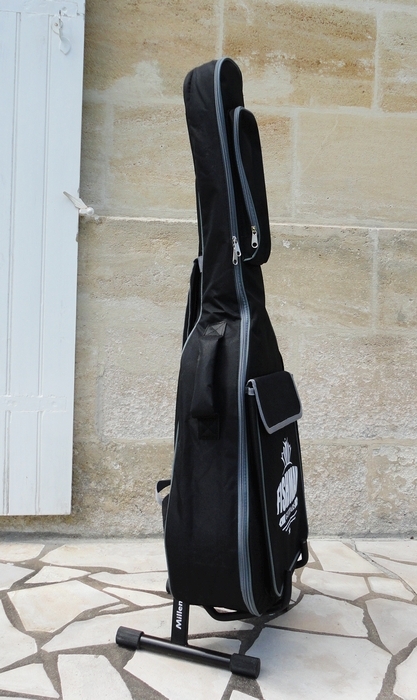 The gig bag is made of tough waterproof 600 denier nylon fabric, black with grey trim and white lettering. It looks really sharp in person. There are two outer pockets, one long and deep, closed by a zip and set into the top, and a wider and shallower pocket attached lower on to the body of the bag and closed by a fold-down flap with a Velcro closure. 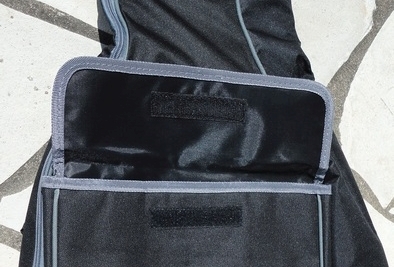 These pockets can take cables, extra strings, capo, tuners, and other accessories without interfering with the smooth surface that goes against the body when the bag is carried as a backpack. The shoulder straps are padded and adjustable and feel very comfortable. There is also a padded handle if you want to carry the bag with one hand. 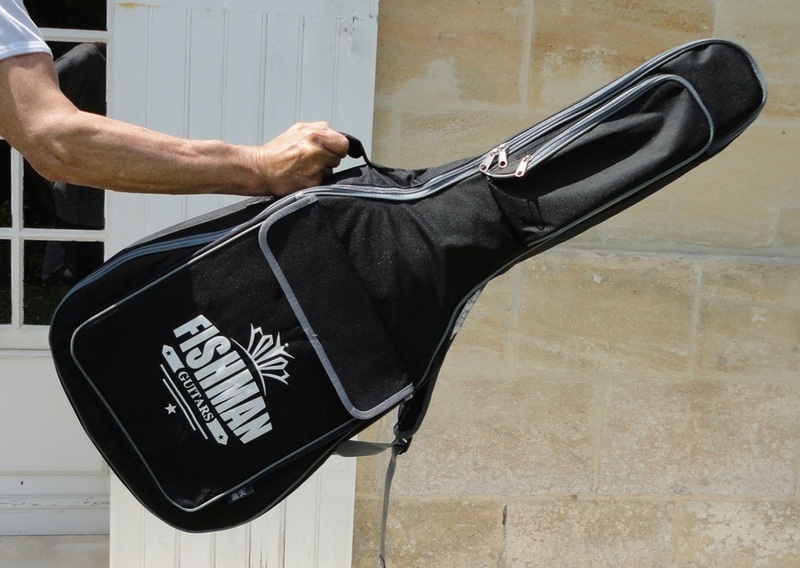 First impressions of a great quality gig bag are confirmed by the details and finishing. The stitches are tight and regular and the zips run easily. 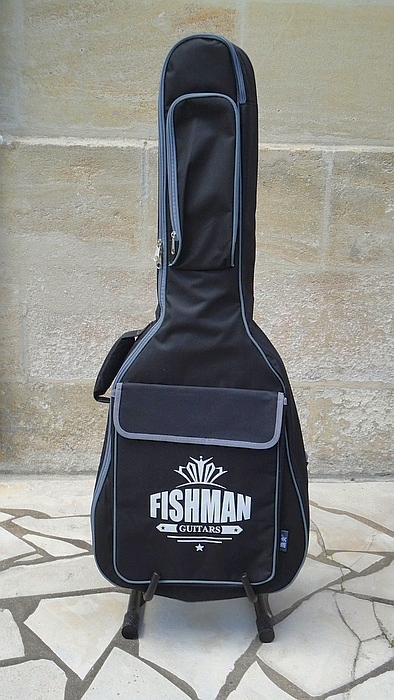 This is a solidly-made, well-designed and executed soft case that will keep your guitar protected from scratches, dust and rain and will make it easy to carry it. 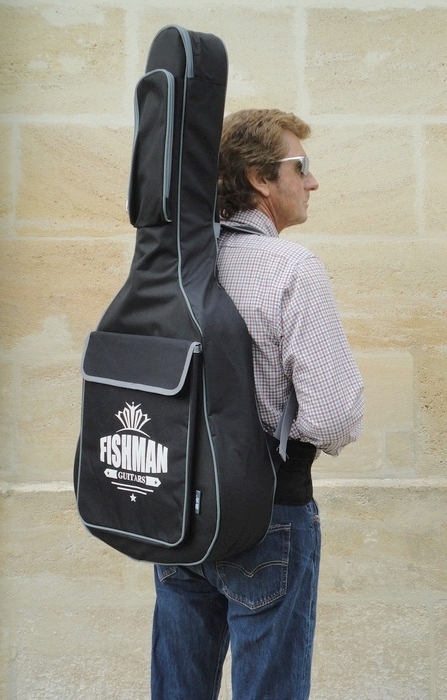 In fact, it's easy to forget that you have your guitar on your back. Just remember that the stock sticks up a long way above your head so use caution when going through doorways! My husband is extremely happy with his new gig bag, especially because he can leave the guitar inside the bag and still rest it on its stand, well protected from dust and knocks. This keyboard is one of the best things I've ever bought ! And talk about value for money ... it certainly compares favourably with most other musical instruments, electric guitars and the like. Since it arrived, four months ago, it has been put to daily use by at least two of us and we are not even close to discovering all that it can do. I had looked at (and nearly bought) the Yamaha NP31 Portable Keyboard and, if the intended user had been a child learning to play piano, it would have been a great choice. As it is, we are all adults with no previous experience and no expectations of becoming classical pianists, so we thought we might as well get something that would be more "fun" than just a piano. And fun it certainly is! There are 497 voices - the vast majority are sampled instruments but some are actual sounds, like a clap of thunder, a dog's bark, a door slamming. My only complaint here was that the XG voices (Yamaha specific) are generally much lower in volume than the main instruments. However, I have found a fix for this: if you turn off the “Touch” option, the voices are louder (how much depends on the voice). In any case, the “Touch” feature is only really applicable to the piano voices, so now I leave it off. Note that when you press the “Portable Grand” button, it automatically turns on the “Touch” feature. The "Play with Style" function is really fun and it means anyone can sit down and mess around with the keyboard while a pre-selected accompaniment plays along. You can speed up or slow down the tempo, have a range of appropriate instruments or just the percussion ones to provide the beat and there are tons of pre-set styles to choose from. It's difficult to describe but really easy to do and it really feels like making music, even if you can't play a scale or name a note. The "Music Database" is a separate function but works generally along the same lines. Again there are hundreds of possibilities. 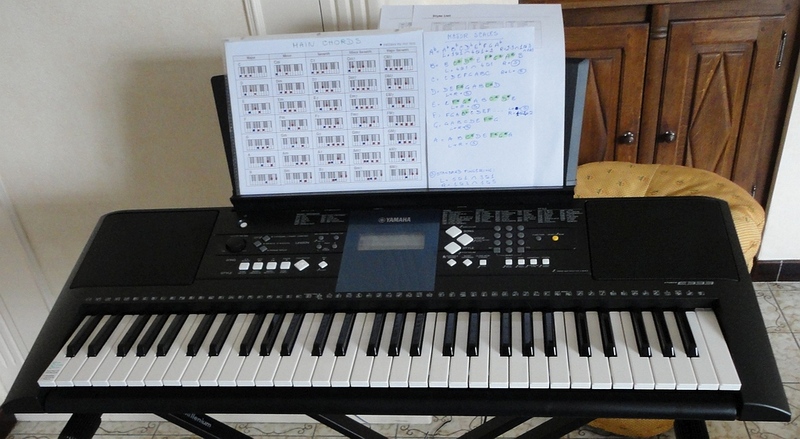 If you want to get serious learning to play (and this keyboard is really a self-teaching tool), there is a Chord Dictionary which will show you which keys to press to make a chord for each note you define. There are 102 built-in songs (and more you can buy) divided in progressive steps, which are really drills to teach you chords or progressions of notes. Even though the available songs are a bit cheesy and old-fashioned, I found that it's worth exploring the steps anyway as they are often arranged in surprising ways. For example, "Twinkle Twinkle Little Star" is available in Basic and Advanced versions. The Basic uses single keys, although in combinations requiring both right and left handed play, while the Advanced is really quite intricate and well beyond my current ability; however, the progressive steps are challenging but do-able and some are arranged in a jazzy style that makes the melody totally unrecognizable and a lot less cheesy. You can record your own playing (up to five "songs" at a time) to the internal memory and even if you don't have the cables and equipment to convert your recordings to MIDI or whatever format a musician would require to manipulate the sound, it is still an excellent feature. Once you have a recording you are happy with, you can set the keyboard to "play" and record the sound using a microphone, the advantage being that you would be recording pure sound without the accidental clicks or noise made by hitting the keys with your nails, or whatever. There is so much to this instrument that it's impossible to cover everything in a review like this, but I can say that the quality of sound is surprisingly good, it's a well-made, solid but light keyboard, it works right out of the box with the enclosed AC adapter and is proving to be a daily addiction of the best kind.